At his best, Charlie Kaufman is a brilliant surrealist whose inventive premises draw attention to the absurdity of life and our collective attempts to find meaning or certainty on shaky ground. At his worst, his films are gimmicky, self-satisfied writing exercises which closely resemble that novel your lame English professor has been working on in secret for the past 10 years. Regrettably, it is the latter type of Kaufman film that has won him a rabid fan base, mostly made up of people with liberal arts degrees who know what "mise en abîme" means and who use "postmodern" (incorrectly) in everyday conversation. His films are undeniably clever and make his viewers feel clever for being able to keep up; but merely having your intelligence stroked is just not good enough. Being John Malkovich was a wonderful comedy because it rarely tried to be anything but funny. Adaptation was impeccably crafted, but only stayed afloat with a constant barrage of self-conscious twists and turns. Emotion has been Kaufman's white whale, something he only achieved convincingly in Eternal Sunshine of the Spotless Mind with the very able assistance of Michel Gondry. Synecdoche, New York seems to be his ambitious attempt to derive high emotion from high pretension. But instead of genuine, nuanced emotion we just get a heavy dose of bottomless depression. 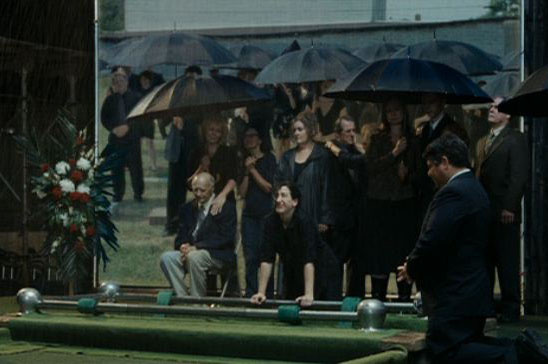 Synecdoche centres around Caden (Philip Seymour Hoffman) an overly intellectual and overly neurotic theatre director whose marriage, career and health are quickly unravelling until he is given a large sum of money and a rather large warehouse in which to stage his magnum opus. He chooses to re-stage key events in his life in a bid to understand where it all went wrong. In his quest for completeness, he ends up rebuilding most of New York in the warehouse, which contains another warehouse which contains another warehouse. As the actors playing Caleb and his friends start casting actors themselves and the players mingle with the real people, his art becomes indistinguishable from his life. Naturally, watching Synecdoche, New York is like experiencing all the bad days of a wasted life compounded into two and a half relentless hours — which is not to say it's not funny, just that it's the kind of funny that's born out of despair rather than the alleviation of it. There are some great surreal bits like Samantha Morton's home being perpetually on fire, but as the film goes on, these aspects become increasingly grim, accelerating the downward spiral. Making a film this depressing is not hard to do. It's a trick used by new directors who haven't found their full range to elicit an emotional reaction. The only movies that match Synecdoche in terms of shameless emotional button-pushing are films like Requiem for a Dream and Kids, which are essentially public service announcements. They bluntly thumb our heartstrings and don't let up, but at least they had a point to make — 'don't do drugs'. Synecdoche's point seems to be 'don't do art'. So what is the point of all this misery? Perhaps Kaufman was trying to simulate actual thoughts of suicide in the viewer (who will probably wish Caleb were euthanised long before the film ends). The obvious lessons are important ones: those who only look inward will inevitably find life passing them by; wanting to control the world and people around you will actually just leave you helpless and alone; those who look for meaning through art alone will only be disappointed. A friend drew a comparison between the plot of Synecdoche and the real life plight of David Foster Wallace, the extremely talented but eye-wateringly ironic author of Infinite Jest, who hanged himself while engaged in a monumental project about humanising the Internal Revenue Service. He disguised his depression behind a virtuoso style but hoped to move past the self-consciousness to more emotionally direct, accessible work. This monumental undertaking remained unfinished after more than 10 years of toiling. He committed suicide rather than face up to his self-imposed expectations. Caden is a similar tragic figure who lets his craft rule his life, and the film is a warning against taking yourself seriously and making such cerebral, pointless art. 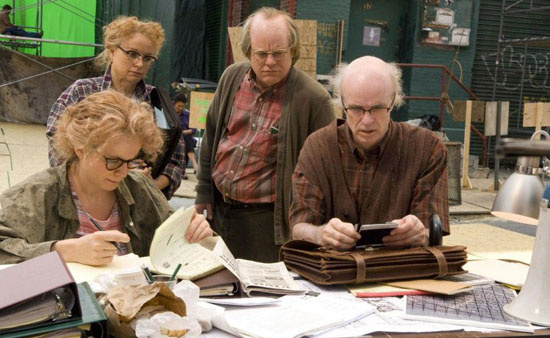 The problem is that Charlie Kaufman is precisely the kind of pretentious artist he is mocking and Synecdoche, New York is exactly the kind of solipsistic work of art which is only truly relevant to the author himself. It's almost as if Kaufman made the film entirely for the purpose of exorcising this aspect of his personality. This of course doesn't invalidate the film's message — being a hypocrite doesn't mean you're wrong, it just means you're too dumb to follow your own advice. Making a morbidly pretentious film about the perils of making morbidly pretentious art doesn't blunt the message, it just makes you resent the messenger. It's almost as if Kaufman made this misguided masterpiece so that future generations wouldn't have to make the same mistake. Self-sacrifice is preferable to suicide, but watching this film is probably not.